Based on my award-winning picture book of the same name. 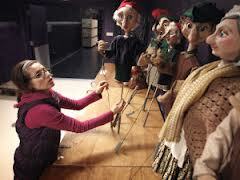 The Children’s Theatre of Charlotte’s 2013-2014 Tarradiddle Players tour, directed by Mark Sutton. 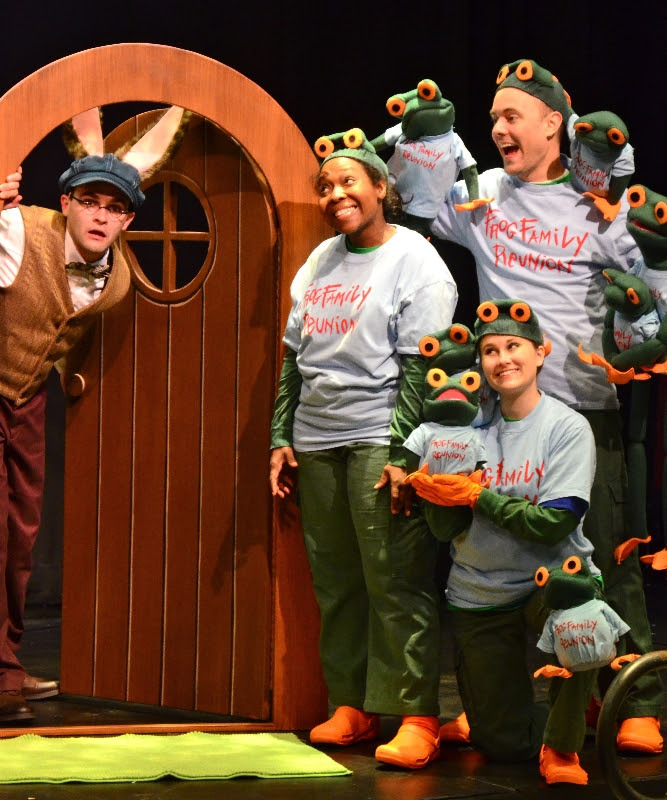 Froggie loves to listen to Rabbit read stories in the Pollyanna Theatre Company production, directed by Judy Matetzschk-Campbell. (http://www.pollyannatheatrecompany.org) Photo by Bruce McCann. Cast: 2m., 2 either gender. Expandable to 21 roles, plus extras as desired. Rabbit lives alone. He cooks for himself, cleans up after himself, and reads himself a nightly bedtime story. It’s a pleasant life, and Rabbit likes it. Then along comes Froggie—wet from a rainstorm, fixing snacks, and fluffing pillows to make story time more cozy. Too much fuss! Too much clutter! 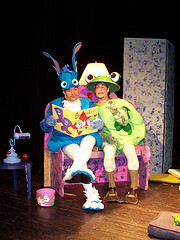 But Froggie listens as Rabbit reads old favorites: Goldilocks and the Three Bears, The Elves and the Shoemaker, and The Ugly Duckling—all magically brought to life for the audience on a puppet stage above Rabbit’s bookshelves while Rabbit reads. But when Froggie invites dozens and dozens of his frog cousins in for a story, Rabbit’s patience runs out: Too Many Frogs! Or is it? Rabbit sends Froggie and his family away, then slowly comes to realize that sharing stories with enthusiastic listeners is a different kind of life—and he likes it! The delightful picture book on which this play is based has been honored with state book awards in Texas and North Dakota and is nominated for many more. One set, with puppet stage. Optional music CD available (underscoring and transition music). Approximate running time: 50 minutes.